Try this homemade version of a beloved classic - spicy, tangy, bright, fresh, and delicious. If you’ve ever had Nando’s, you’ll recognize these flavors. 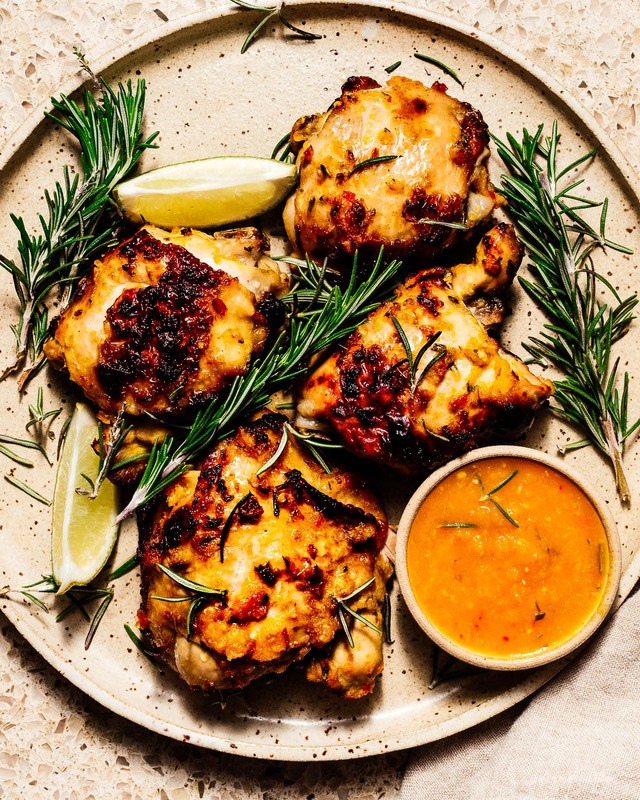 This is an easy weeknight recipe for portuguese-by-way-of-historically-unethical-african-colonies perfect oven broiled chicken thighs with spicy piri piri sauce. Nothing about this recipe is authentic, but damn if it doesn’t taste good with only 6 ingredients. It’s spicy, bright, tangy, sweet, and delicious. 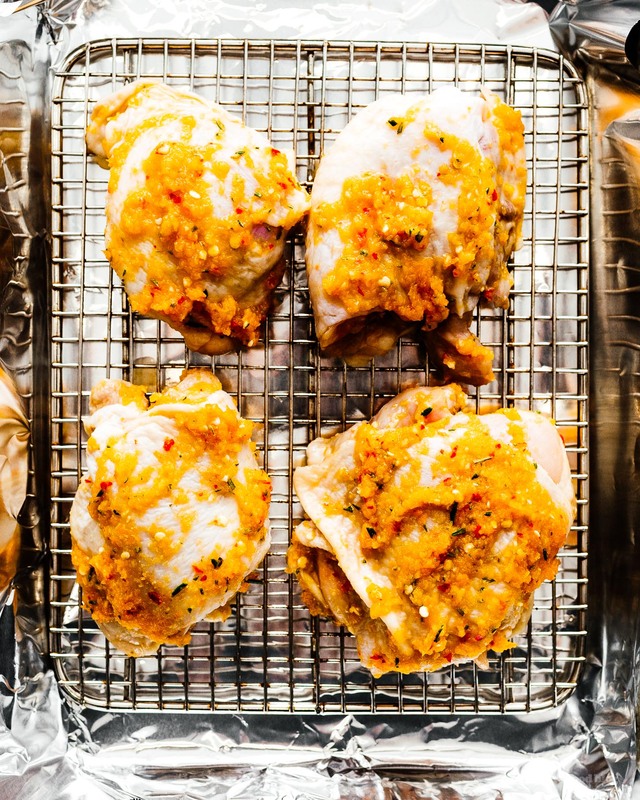 Leaving the chicken out while you marinate it lets it come to temperature for more even cooking. 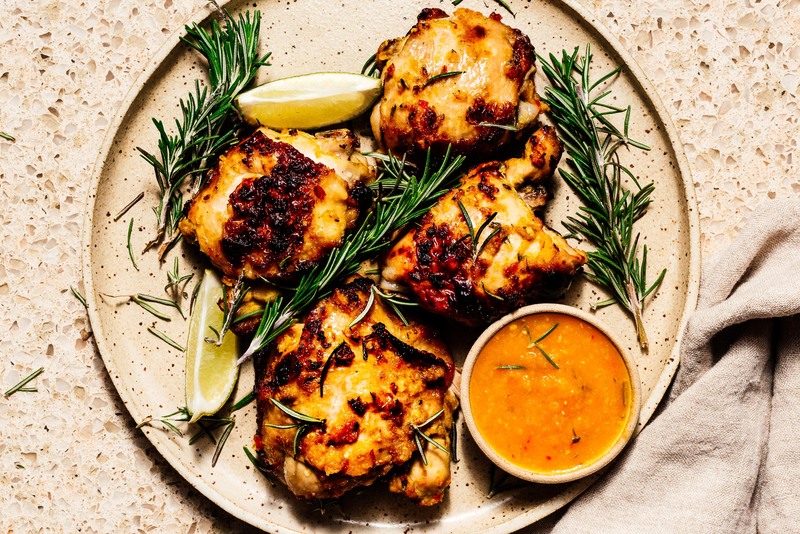 If the idea of this makes you squeamish, you can marinate in the fridge, but then you’ll need to add additional cooking time and, ideally, use a meat thermometer to check when the chicken has come to about 180°F. You should marinate the chicken for as long as you can, but know that it takes 30 minutes for the chicken to cook. 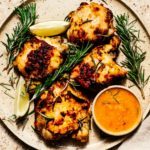 Piri Piri sauce is traditionally made with African bird’s eye chiles, which are far, far spicier than anything you can get in a grocery store. In this recipe, I went with Thai bird’s eye, which are plenty spicy. So spicy in fact, that you should carefully consider how spicy you can handle. The recipe calls for 4, if you can’t handle spice, go for 1, or even none. A blender, an oven, and a baking sheet with a rack that fits. Optional but great: a meat thermometer. You can demolish this on its own, or you can serve with portugese rice, potatoes, or a nice salad. You can also sub wings or a whole chicken for the thighs. 1. 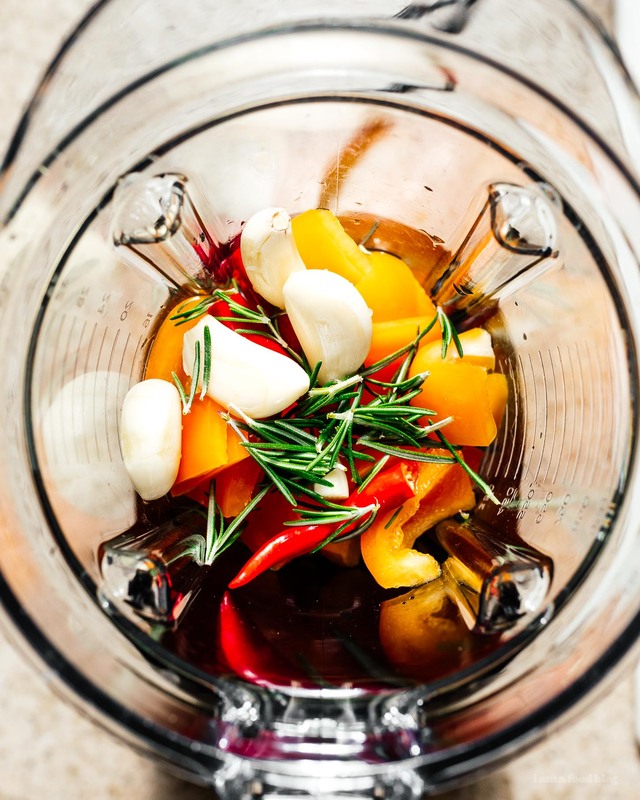 Make a marinade by blending the vinegar, thai chilis, bell pepper, garlic, sugar, and rosemary, if using. 2. Season your chicken thighs with salt and pepper to taste (I omitted this step, to be honest – it didn’t seem to need it). 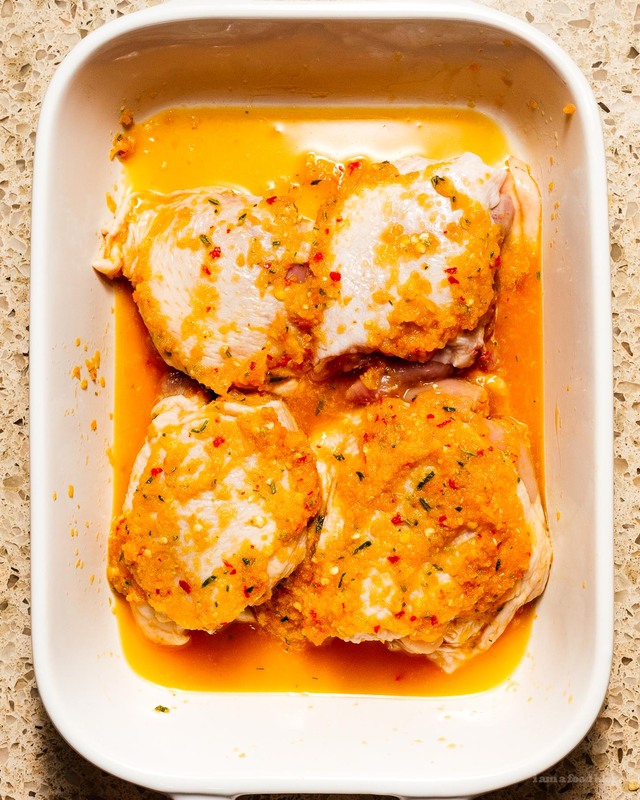 Marinate your chicken thighs with half of the sauce for a minimum of 15 minutes and up to two hours. 4. Meanwhile in a small saucepan, bring the other half of the sauce up to a very low simmer and hold it there until you are done. 5. When you are done marinating, position the chicken on the rack spacing each thigh about 1/2” apart. 6. Place the chicken in the oven, check back every 5 minutes or so for signs of burning, you want a little char, but not too much. 7. After 15 minutes has elapsed, flip the chicken and place back in the oven for another 15 minutes. 8. 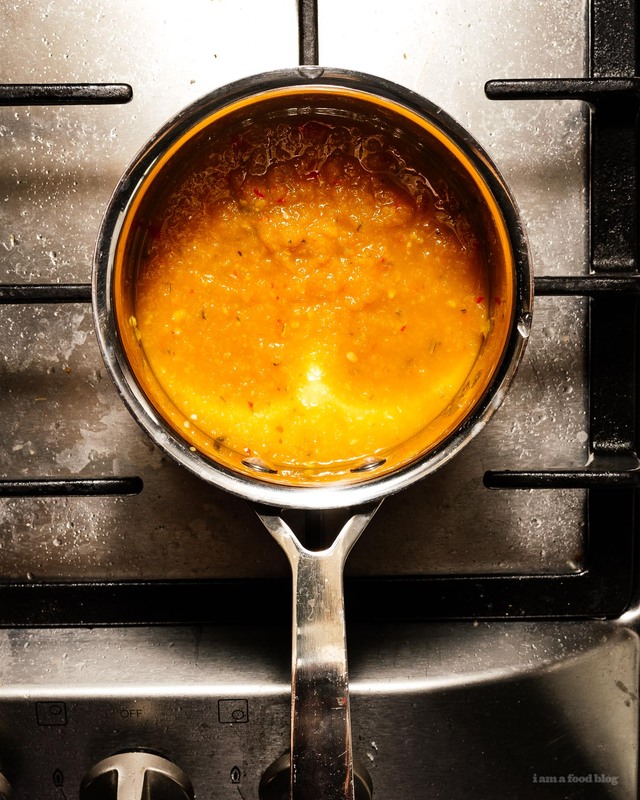 Remove and serve with the simmered piri piri sauce. Good catch! Yes it’s about as long as your oven takes to heat up, but longer is better. I’ve edited the recipe to say this, thanks! What type of vinegar? Thank you! Apple cider vinegar, thanks for the reminder! Skinless chicken thighs? I can’t tell from the pics – old eyes I suppose.